Mozilla has publicly decried the Cyber Intelligence Sharing and Protection Act (CISPA), a controversial cybersecurity bill recently approved by the House of Representatives that is now being considered in the Senate. The purpose of CISPA, which was introduced to the House in November 2011, is to allow the government and corporations to work together to protect the United States from foreign online attacks. The bill has been criticized because it includes a provision that would let companies share users' private data with government agencies, in the event of cyberattacks. The bill passed last Friday after the House added new amendments that extended that controversial provision beyond just cyberattacks; companies will now be able to share users' private data in the event of "computer crime," exploitation of minors, and to protect individuals from "the danger of death or serious bodily harm." Needless to say, such a broad definition of when data can be shared concerns many people. The Electronic Frontier Foundation is avidly against CISPA, and claims that the proponents of the bill are "inciting fears of security threats" that have existed for years. CISPA "opens the floodgates" for companies to "intercept communications of everyday Internet users and pass unredacted personal information to the governments," says Rainey Reitman, activism director for the Frontier Foundation. A group of security experts, professors and academics and engineers wrote an open letter to Congress, stating their criticism of CISPA. 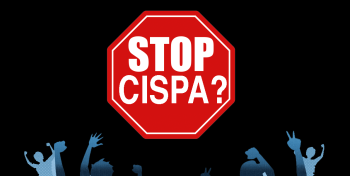 The White House has also stated its opposition to the bill, and the Obama administration has threatened to veto CISPA if the measure os approved by Congress. Despite privacy concerns, CISPA has enjoyed support from many high-profile tech corporations, including Microsoft, Facebook, Intel, IBM, Oracle and Symantec. Microsoft even reaffirmed that its position remained "unchanged." One major tech player, Google, has yet to voice an opinion on the bill.